as much as faculty and administrators in church-related colleges and universities would like to think that our decisions are always oriented by our institutional missions, there are times when we make decisions for instrumental reasons. Often we know that this is the case. We may even feel a sense of regret about the necessity that we believe is forcing us to look past the substantive ends for which our institutions were founded. At our worst, we may not even recognize the implications of our actions. Over the long haul, however, the cumulative effect of short-sighted decision-making becomes evident: we thwart our own stated intentions to carry out our distinctive missions as church-related institutions of higher education. Two recently published books explore this nest of problems in ways both illuminating and practical. 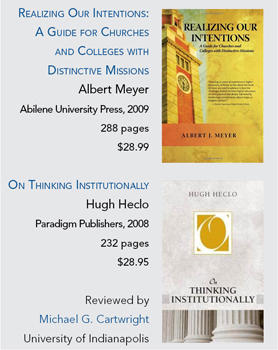 Albert Meyer’s aptly titled book Realizing Our Intentions: A Guide for Churches and Colleges with Distinctive Missions is a straightforward exploration of how decision-makers should proceed in institutions founded by Christian communions. Hugh Heclo’s book On Thinking Institutionally, although not limited to an analysis of higher education, is also filled with insights that will be helpful to faculty and administrators who are negotiating the tricky terrain of American higher education. The author of Realizing Our Intentions, who served for more than three decades as the head of the Mennonite Board of Education, writes frankly from a “post-Establishment perspective.” In fact, Meyer suggests that an apt subtitle to this book might have been “Church-College Relations in a Post-Establishment Era” (12). In keeping with his Anabaptist sensibilities, Meyer thinks that ecclesiology matters. From Meyer’s vantage point, whether a college is viewed as “an integral part of a larger church” or simply as “an independent school that contracts or covenants with a church body” (263) makes a crucial difference. The criteria by which one would measure institutional stewardship shift significantly depending on which kind of covenantal relationship is in view. Where the church’s mission in higher education is not defined by dreams of Christendom-like establishment (Protestant or Catholic), Meyer believes that there is good reason to hope that colleges with distinctive missions can thrive, provided that such institutions can state the different outcomes that they are seeking as compared with colleges with more generic secular missions. So it matters whether faculty and administrators in church-related institutions are willing and able to talk about the kinds of activities and behaviors (e.g. service) that we would like to see in our students (98). This kind of intentional approach to the administration of church-related higher education presumes a different kind of epistemology than is commonly assumed in American secular institutions. Drawing on the work of Parker Palmer, Meyer identifies the central issue as whether or not we think that transformation is one of the ends of education. If we do, then “church people in education.... will want to go beyond describing the world as it is. They will want to image a world that, in God’s providence, can and should be” (93–94). Sustaining an environment in which this kind of intellectual, moral, and spiritual transformation of students is viable will require that institutional leaders exercise great intentionality, to be sure. But Meyer reminds us that this is made possible by our trust in God’s provision of resources, whether these take shape as monetary means or as human skills. Meyer also reminds his readers that if we believe that transformation is an end of education this then has implications for how we think about the outcomes by which we want the effectiveness of teaching and learning to be judged. He is quite clear in saying that the way faculty and administrators go about assessing the effects of church-related education cannot be limited to measuring students’ cognitive development. Meyer dares to suggest that university leaders ask whether a graduating senior of a church-related university with a distinctively Christian mission would be “more ready than its first-year students” to respond to a situation of human need by altering his or her life plans (92). Using this kind of “Good Samaritan” standard, Meyer believes, is a way of forcing institutions to be candid about whether they have a distinctive vision or not. Where denominations continue to assume that they are part of the “mainstream” establishment, Meyer candidly states that the problem of the church-college relationship lies with the character of the church itself (264). Noting the drift toward “secularized conformity,” Meyer keeps his focus throughout the book on ways that “colleges and universities with distinctive missions can and should make a special contribution to American higher education.” Meyer also warns of the dangers of “living in the past,” in the sense that some churches want to hang on to the institutions that they helped to create as if having an “historical affiliation” is an actual working relationship. At the same time, Meyer believes that any institution that wants to carry out a distinctive mission must be able to “provide for research on the experience of the past and for developing ways of working that meet the challenges of the future” (280). In such matters, Meyer is very practical. In fact, the last part of the book consists of a set of specific steps that boards, faculties, and churches can implement” (13). He engages the literature about the optimal size of boards of trustees (seven to twelve, not thirty to forty! ), and he draws the attention of readers to empirical studies that question the “conventional wisdom” that enrollment growth is always economically and academically advantageous” (176). He cites multiple studies that show that the widespread belief in “economies of scale” is illusory. On the other hand, Meyer thinks that faculty, administrators, and trustees all should think more seriously than we probably have about the “accentuation effect” whereby common characteristics are accentuated through their mutual interaction (130). This means it really does matter who we recruit to be students. In fact, studies have shown that student interaction—not faculty engagement with students—may be one of the most important factors in the moral and spiritual formation of students. Meyer contends that one of the most notable weaknesses of church-related higher education in the twentieth century has been “its failure to bring longer-term perspectives into its decision-making structures and procedures” (210). At the same time, he thinks it should be possible for institutional leaders (boards of trustees as well as chief administrators) to ask the following question: Does the education that a student receives at a church-related institution have any effect on the student’s capacity to display Christ-like love in his or her interactions in the world? In fact, Meyer suggests that this could be a proper focus for ongoing assessment and evaluation of curricular and co-curricular programs. Albert Meyer argues in a compelling way that we need to re-orient how we make decisions in church-related universities. He encourages institutional leaders to think of faculty hiring not so much as an episodic process in which departments are given autonomy as a long-term process of selection and recruitment that requires that administrators and trustees exercise greater intentionality. He calls for the kind of systemic change that would involve “a kind of paradigm shift in faculty recruitment” in which we move away from a selection processes to a much more proactive search process (206). 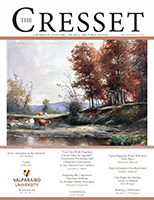 Instead of having searches constituted in terms of short-term considerations as defined by faculty committees and administrative judgments about enrollment, he proposes that faculty should be reframed as a kind of “long-term faculty planning.” Just as colleges and universities invest in planning for deferred giving, they should be “planning for deferred service.” Accordingly, they should also create vice-presidents for the role of “strategic faculty recruitment” (160). Because Meyer served for more than three decades as the head of the Mennonite Board of Education, he brings a great deal of practical wisdom to bear on this topic. At a few points, however, Meyer tends to write off church-college affiliations as if ambiguity is always incapacitating. I found myself thinking that Meyer, at some points, rules out possibilities that should not be prematurely foreclosed. For example, the somewhat conflicted and enigmatic mission statement articulated in the 1904 bylaws of my own United Methodist-related university remains relevant to the institution that has a diverse student body in the twenty-first century. Further, I would argue that the awkward language provides us with the opportunity to register what that could mean in the context of various social conflicts of our own time. My university was founded at a time when it was beginning to dawn on its leaders that the most important problem of the twentieth century was “the problem of the color line” as W. E. B. Du Bois memorably stated. Today, many faculty and administrators at church-related universities find themselves agreeing with Eboo Patel’s contention that the conundrum that we dare not ignore in the twenty-first century is “the problem of the faith line.” We should not forget that the clarity of our missions as church-related colleges and universities is to be achieved in the context of our engagement with the challenges and opportunities of our time and place. Having said that, I heartily concur with Meyer that, in these matters, the proof of whether we want to have distinctive missions lies in the way we carry out our responsibilities. If institutions like my own university are not able to find ways to inculcate our church-related mission in the faculty and administrators that are hired, institutional drift will occur and we will not realize our intentions. 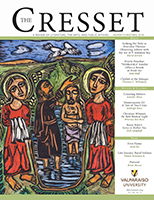 On the other hand, it may very well be that in the context of the kinds of interfaith engagements we are experiencing in the twenty-first century, church-related educators will discover a newfound ability to articulate the distinctiveness of our missions precisely because we want to display both breadth and depth. In the meantime, we can be thankful that wise leaders like Albert Meyer have taken the time and trouble to pass on what they have inherited. As Heclo explains, the IDEALS model of critical thinking purports to be purposeful and ­self-regulatory. Indeed, this pattern of reasoning “presumes that no external correctives from the surrounding material of history, religion, or culture are necessary. It is an educational agenda that teaches students how to fit into a larger culture that is telling you to believe what you like, but trust nothing” (95). And therein, we begin to detect a pair of tragic ironies with this model. As Heclo delights in pointing out, students are rarely if ever “encouraged to be critical about the critical thinking movement itself” (96). In fact, often “no empirical evidence [is] offered to support [these] claims about the benefits to students” of teaching such curricula. Finally, if “the main goal of education… [as advocates of critical thinking assert] is to reveal the reality-creating social, historical, and psychological forces that shape our lives” (94), then the results of teaching critical thinking may run contrary to our transformative intentions. Student practitioners of critical thinking may come to think of themselves “not as persons but as disassembled, hermetically sealed compartments of critical intelligence, personal moral preference, and basic instinct” (95). This leaves students—as well as faculty and administrators—unable to lead integrated lives that thrive and flourish in the midst of institutions that serve the common good. 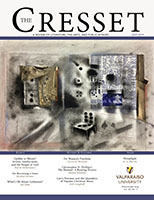 As Heclo cogently argues, no matter how much faculty and administrators know about what a university is and how it operates, if they lack “an internal point of view” that values the university as an institution, then they are likely to continue to discover that they are the sources of their own most vexing problems (78). Institutional thinking “has to do with living committed to the ends for which organization occurs, rather than to an organization as such” (90). Or as Heclo counsels, “Thinking about institutions may make you a social scientist, but thinking institutionally can actually help make you a more fulfilled human being” (82). Prof. Heclo understands that this is a bold claim. Accordingly, he devotes considerable space to spelling out what it means to think and to act in ways that keep institutional ends in view. “As a basic orientation toward life, institutional thinking understands itself to be in a position primarily of receiving rather than of inventing or creating. The emphasis is not on thinking up things for yourself, but on thoughtfully taking delivery of and using what has been handed down to you” (98). Heclo hastens to add that this does not require that we foreclose the possibility that innovations can address such concerns. Rather, he wants his readers to take seriously that improvisations are “intelligible and possible because there is an inherited background against which to improvise and be playful” (100). If Hugh Heclo is right, then future faculty and administrators of church-related colleges will need to pay more attention to “the wisdom of daily experience.” Contrary to the perspectives of popular culture, Heclo urges us to see how practical wisdom can derive from the fabric of working relationships that are enacted in the midst of institutional frameworks. As it turns out, when faculty and administrators do pay attention to collegial relationships as a source of moral wisdom, they also have the opportunity to re-think their own sense of what it means to have a vocation. Heclo readily confesses that it is “painfully clear that professors... can be seen minimizing if not shirking their duties to their students and universities, duties that supposedly lie at the heart of the professor’s calling to be part of an ‘institution’ of higher education” (78). Heclo argues that we need not be content with this state of affairs. Indeed, he argues that we can learn to engage in the “countercultural” activity of thinking institutionally. What makes this approach to institutional decision-making countercultural is that it involves thinking simultaneously about the past, present, and future. I suspect that Heclo and Meyer would agree, even if for different reasons, that institutional thinking in church-related colleges and universities will continue to be “an uphill climb” given the current struggles of higher education in the United States and beyond. And that climb begins by reminding ourselves that it is not enough for leaders of church-related colleges and universities to display skills in critical thinking. We need to take purposeful steps to cultivate the capacity to exercise wise stewardship of the institutions that we inhabit. I suspect that in many instances, to do so will entail changing the way that we think about the decisions that we make in relation to those who will come after us. One of the most radical approaches to decision-making in church-related higher education that I have ever encountered comes out of the Anabaptist tradition. The guideline can be stated this way: In making critical decisions, faculty and administrators should not presume that they are to take any action that would attempt to make the challenges the next generation of leaders will face any easier or harder than they are for the present generation. Such a resolve requires a robust belief that God actually is involved in human affairs—not to mention the capacity to trust that human beings who lead institutions will act in ways commensurate with God’s provisions in the past, present, and future. Many institutional leaders find this kind of intentionality to be counterintuitive—not to mention naïve and impractical! But if we follow Albert Meyer’s counsel, sooner or later we have to confront the question of whether we really think God is at work in us and in our institutions. Indeed, I am tempted to say that this may be one of the most critical tests of whether church-related colleges and universities have the capacity to sustain distinctive missions in the twenty-first century. In the meantime, administrators of church-related colleges and universities will continue to track all the other indicators that help us to determine whether we have realized the intentions for which we were founded.